Can South Carolina get Back on Track? 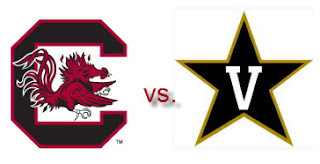 This week the Gamecocks try to right the ship against the Vanderbilt Commodores after last week’s loss to the Georgia Bulldogs at Sanford Stadium. The Gamecocks are hoping to come home and get a big win that will set them up for the rest of the season against the Commodores, who have given the Gamecocks trouble in the past. Carolina's defense will have a big test against Jordan Matthews who is one of the greatest receivers in the country this year. Despite their opening lose to Ole Miss this year, the Vanderbilt Commodores look to be an SEC competitor unlike in years past. In his time at Vanderbilt, Coach James Franklin has built a great team with competitive power in the SEC. While it doesn't appear that they will contend for the SEC East crown this year it does look like they could upset somebody else's run to the Title game. Jordan Matthews' ability to run after catch will be a big test for South Carolina's secondary that showed great gaps in coverage in the game last week. Also look for true freshman, wide receiver Jordan Cunningham to continue to get looks on offense as teams try to double cover Matthews. If Vanderbilt’s defense can hold the Gamecocks to a low-scoring game, their offense has the big-play ability to pull the big upset this weekend in Columbia. To put it mildly, South Carolina's defense looked rough last week. Georgia was able to run right down the middle and exploit South Carolina's young defensive front. Many defensive players for South Carolina have vowed that they will play better, both as a unit and individually, to stop the run for the rest of the season. If the Gamecocks can find a way to stop the run and keep the ball out of Jordan Matthews’ hands, they should win the game easily given that both Connor Shaw and Dylan Thompson are expected to play quarterback this weekend. Connor played well last weekend, but he still is too eager to run the ball when he should sit in the pocket and throw down field to his open receivers. South Carolina's offensive line looks to be the strongest Spurrier has had under his direction in Columbia, which should allow both Mike Davis and Brandon Wilds to run the ball effectively this weekend against the Commodores. At Spurrier's press conference this week, he mentioned that Dylan Thompson will get playing time, which means we can look for the big passing plays downfield that we don't often see with Connor Shaw. Jordan Matthews will exploit the young defense, especially the secondary, and South Carolina will have a battle on their hands in Columbia on Saturday night. Despite this big play ability, South Carolina will win the game due to the efforts of both quarterbacks Connor Shaw and Dylan Thompson. And as I mentioned last week, keep looking for Brandon Wilds to make big plays when he gets the opportunity.